Torrent site LimeTorrents has changed its domain name and updated its homepage in response to various blocking efforts. The site hopes to bypass ISP blockades, at least temporarily, but also to counter a Google ban. While the site is determined to stay online, its operator says that running a torrent site is not getting any easier. 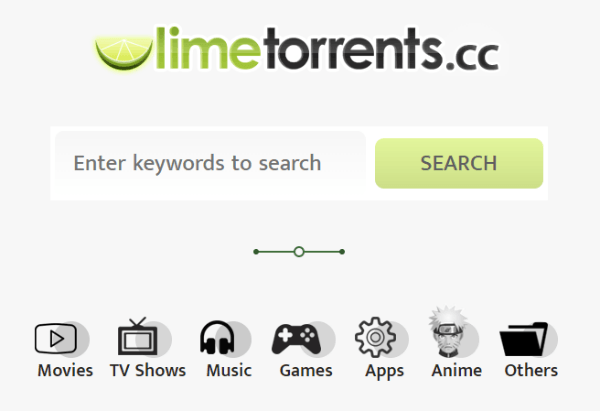 Founded in 2009, LimeTorrents has been a familiar name in the torrent ecosystem for nearly a decade. The site is regularly listed as one of the ten most-visited torrent sites on the Internet. However, as a prime source of pirated content, it has also seen plenty of trouble over the years. During the site’s early days, music group IFPI seized its servers, for example, and a few years later the site’s operator got dragged into a lawsuit by Lionsgate over the Expendables 3 leak. Despite these issues, the site remains alive and well. That said, running a torrent site isn’t exactly getting any easier. Earlier this week LimeTorrents switched to a new domain, limetorrents.io, with a new homepage (see update below). This is a direct response to the ISP blocking efforts around the world. In addition, the new domain should also get the site’s homepage back in Google’s search index. “We changed our domain to .io because [the site is] blocked in many countries like India, UK, Australia, and also because our old homepage was removed from Google’s search index,” LimeTorrents’ operator tells TF. The new version of the homepage no longer lists direct links to pirated material. This means that copyright holders have no reason to ask Google to remove it from the search index, as previously happened with the old version. With this new look and domain, LimeTorrent hopes to set itself apart from the many copycats that have appeared. According to the operator, there are several “fake” LimeTorrents copies trying to steal traffic, only to generate revenue for themselves. People who can’t use the official domains can use the official proxies Limetorrents.info, Limetorrents.asia, Limetorrents.zone, the site’s operator says, but he cautions users who choose other sites. In addition to the torrent index, the operator also runs the torrent cache itorrents.org, which many other sites rely on. ITorrents hosts torrents without a search interface and is used by other torrent sites such as 1337x.to and the mobile version of The Pirate Bay. LimeTorrents’ operator tells us that iTorrents currently stores over 20 million unique torrents and many more are added every day. While this may sound positive, operating a torrent site certainly hasn’t become any easier. It gets harder and harder to make revenue, and income has dropped drastically since the early years. “Earnings dropped around 60 to 70% because affiliate sites are no longer paying webmasters well. Popups and ads are not working either because of ad-blockers,” LimeTorrents’ operator says. It’s also become harder to find stable hosting, which is likely the result of increased enforcement. However, there is a threat from within the piracy ecosystem as well. Ten years ago torrent sites were dominating the piracy landscape but today more and more traffic is flowing to streaming sites. That being said, LimeTorrents’ operator says that people know where to come when they want to get content first, noting that many streaming sites use torrent portals as their source. “People who know how to find things know where it comes first. If torrent sites die, streaming sites will also be hit hard because they can’t find content to upload to their sites, as torrent sites are their source,” the operator tells us. Update August 2018: LimeTorrents moved to LimeTorrents.info as the site continues to face domain troubles.